Every year, Patrick and I host an Oscar's viewing party at our apartment with friends (details from last year's party seen here). We try and see all the best picture nominees each year, so we get pretty excited and emotionally attached to the award show. 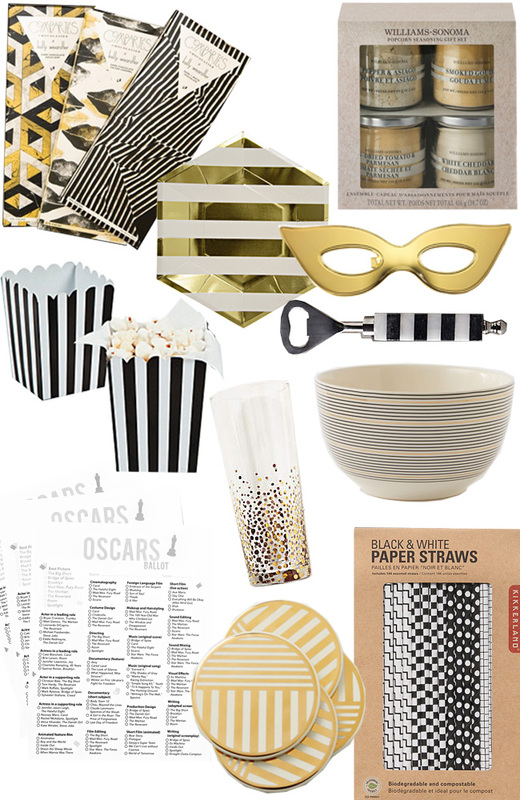 It's fun to make predictions, drink champagne and munch on classic movie theater snacks. If you're looking to do the same, above are some items that won't break the bank but will still make the night feel special. If you're looking to go all-out with the theme, here is some fun inspiration. Speaking of predictions, I think The Revenant is going to sweep! Have you seen the nominees? Looks very nice!I love the whole concept of it.